Easy Gluten Free Carrot Cake Recipe. Makes a fabulous cake. This Gluten Free Carrot Cake Recipe is easy to follow and creates a beautiful cake bursting with flavour. This is one of our favourite gluten free treats. It includes raisins and yogurt, which together with the grated carrot make it an exceptionally moist light cake. With the cinnamon giving it a hint of spice we found it difficult to only have one slice. 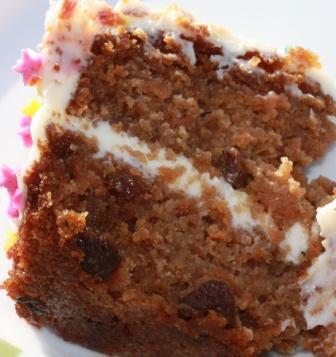 We used this gluten free carrot cake recipe to make a gluten free birthday cake recently and it was given a resounding thumbs up by everyone at the birthday tea, those who needed gluten free and those that didn't. What could be better, an easy gluten free carrot cake recipe that makes such a tasty cake that everyone will want a second slice. These quantities will make one 7 inch gluten free carrot cake. We love frosting, so for the birthday cake we had a layer of frosting in the cake as well as covering the cake. 1. Pre heat oven 350⁰F, 180⁰C (160⁰C fan oven), gas mark 4. 2. Grease and line 7 inch/18 cm round loose bottom cake tin. 3. Mix, with a balloon whisk, the sugar with the vegetable oil and then gradually add in the eggs. 4. Fold in the flour, cinnamon and bicarbonate of soda. 5. Add the carrots, raisins and yogurt and mix thoroughly. 6. Tip the mixture into the prepared tin and bake for 45 – 60 minutes until firm to touch. Test the cake is ready by inserting a skewer into the centre of the cake, if it comes out clean, the cake is ready. 7. Transfer to a cooling tray and carefully remove your gluten free carrot cake from the tin once it has cooled, allow to cool completely. Beat the soft cheese with the icing sugar until smooth. 1. Cut your gluten free carrot cake in half horizontally. 2. Spread some of the frosting into the middle and sandwich together. 3. Spread the remainder of the frosting over the top and down the sides of the cake.